Throughout the course of the year CRCA runs several competitions across the club's full racing calendar. The winners of these awards are honored with trophies at the club's annual year-end party. Current standings for all CRCA Individual and Team Competitions are available under Results & Standings. The CRCA Jim Boyd Cup is a season long individual prize that is the most prestigious award in New York City cycling. 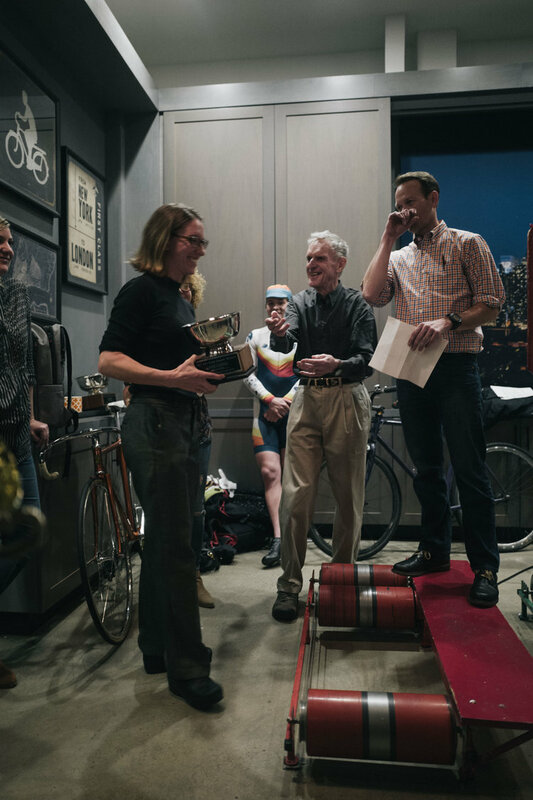 Comprised of the CRCA Club Series and the CRCA Open Racing Calendar the Jim Boyd Cup is awarded to the most outstanding male and female cyclist in CRCA (A and W field). The Jim Boyd Cup is named for longtime CRCA President Jim Boyd. Similarly the Team Cup is awarded to the most outstanding CRCA sub-teams throughout the course of the entire CRCA race season. CRCA sub-teams in the A and W field are eligible for the award. This has been one of the most hotly contested CRCA awards in recent years. In contrast to the Jim Boyd Cup, the Lou Maltese Club Series Championship is a one-day competition awarded to the winners of the A and W fields on the Club Series date identified as the Club Championship. There is also a separate M40+ Club Championship field as part of the Lou Maltese Club Championship that will award titles for M40+, M50+ and M60+ age ranges. CRCA awards two titles in the B-Field: the B-Field Series Leader is scored similarly to the Jim Boyd Cup and goes to the most successful B-Field rider throughout the course of the CRCA Club and Open Racing Season. The B-Field Team Competition similarly mirrors the Team Cup and goes to the CRCA sub-team with the greatest success in the M4/B field throughout the course of the year. If a rider upgrades from the B-Field they retain all previously earning B-Field Series Leader points but cannot earn any further points. In this instance the B-Field Series Leader Jersey will roll down to the rider with the highest points total currently racing in the B-Field. The end-of-season award goes to the rider with the highest point total even if they upgraded during the season. The CRCA Masters Series Leader Title is awarded to the Masters racer who scores the most points across the CRCA Open Racing and Club Series Masters Fields. The CRCA Masters Series Team Competition mirrors the other team based awards for the CRCA Open Racing and Club Series Masters fields. The Elite Men’s and Elite Women’s CRCA Boyd Cup is the highest honor awarded to CRCA racing members based on a season long points competition across a variety of courses and formats. The CRCA Elite Team Cup is awarded on a similar basis to the most successful CRCA sub-teams across a similar subset of races. All club and open races are included in scoring for the Jim Boyd Cup and Team Cup Awards unless otherwise specified on the CRCA Racing Calendar. CRCA members will be scored separately for the Open Races (i.e., non eligible racers will be skipped over and points will roll down to the next eligible CRCA member). All Open Races (including a TT to be announced) are worth double points and the Lou Maltese Club Series Championship is worth double points. Boyd Cup and Team Cup points are awarded as follows, for Club Races places 1st- 7th: 10, 7, 5, 4, 3, 2, 1. Open races receive double points and so the total is as follows for places 1st-7th: 20, 14, 10, 8, 6, 4, 2. As stated the Open Races will feature separate scoring for CRCA members. For the Team Cup, teams score points for their top two riders only. If additional riders from a team place, the points for those places are not counted toward calculating the Team Cup points for that team or any other team. For example, if Team A has 3 riders scoring in the top 3 placings, the 3rd placed Team A rider will not score points for Team A, but Team B rider at 4th place will score 4th place points, not 3rd place points. The Team Cup will also include points from a Team Time Trial, if any, to be held as part of a CRCA affiliated time trial, if any, to be announced. CRCA members will be scored separately at any such competition and points will be awarded on an Open Race basis. Only full Season Pass/Racing club members may score points for either competition. Associate members participating in open races cannot score points. If a teammate is disqualified for a conduct violation in a given race, the team in question will score no points in any CRCA competition. The champion for each competition will be the individual / team with the most points at the conclusion of the season. In the case of a tie, finishing position at the Club Race season finale will determine the winner (for the team cup highest individual placing at that race will determine the winner). The B-Field Series Leader and Team Competitions mirror the Jim Boyd and Team Cup competitions but for non-elite riders racing in the B-Field. The CRCA B-Field Series Leader is awarded on the same basis as the Elite Men’s and Women’s Jim Boyd Cup, but for the B/M4 fields. Scoring is done on the same basis as the Elite Men’s and Women’s Boyd Cup, with the same races included in the competition. The CRCA B-Field Team Competition is awarded on the same basis as the Elite Men’s and Women’s Team Cups, but for the B/M4 fields. Scoring is done on the same basis as the Elite Men’s and Women’s Team Cup, with the same races included in the competition. For Open Races points will be scored in the M4 field. If no M4 field is offered points will instead be scored in the M4/5 field. For Club Races points will only be scored in the B field. The Masters Series Leader and Team Competitions include as many as seven races, including both Club and Open races with similar scoring to the Jim Boyd and Team Cup except for riders racing in CRCA's Masters fields. The CRCA Masters Series Leader is awarded on the same basis as the Elite Men’s and Women’s Jim Boyd Cup, but for CRCA's Masters fields. Scoring is done on the same basis as the Elite Men’s and Women’s Boyd Cup, with the same races included in the competition. The CRCA Masters Team Competition is awarded on the same basis as the Elite Men’s and Women’s Team Cups, but for CRCA's Masters fields. Scoring is done on the same basis as the Elite Men’s and Women’s Team Cup, with the same races included in the competition. The races included in the Master’s competitions will include: all open races featuring an M40+ field, or a M35+ Master’s field at Grant's Tomb or Bear Mountain if applicable (lower age cut-off reflects NYS Championship Categories), all of the club race M40+ fields in Central Park and a CRCA affiliated Time Trial to be announced, if applicable. The most improved rider award shall be selected by the CRCA Board following the conclusion of the race season. The award target riders that have have made the greatest strides from the development levels of the Club.